2. 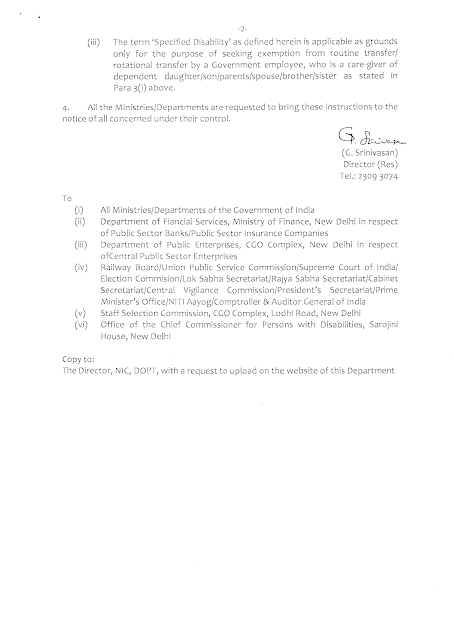 The scope of disability initially had covered (i) blindness or low vision (ii) hearing impairment (iii) locomotor disability or cerebral Palsy(iv) leprosy cured (v) mental retardation (vi) mental illness and (vii) multiple disabilities, which I subsequently, vide OMs of even number dated November 17, 2014 and January 5, 2016, was further extended to include ‘Autism’, ‘Thalassemia’ and ‘Haemophilia’. 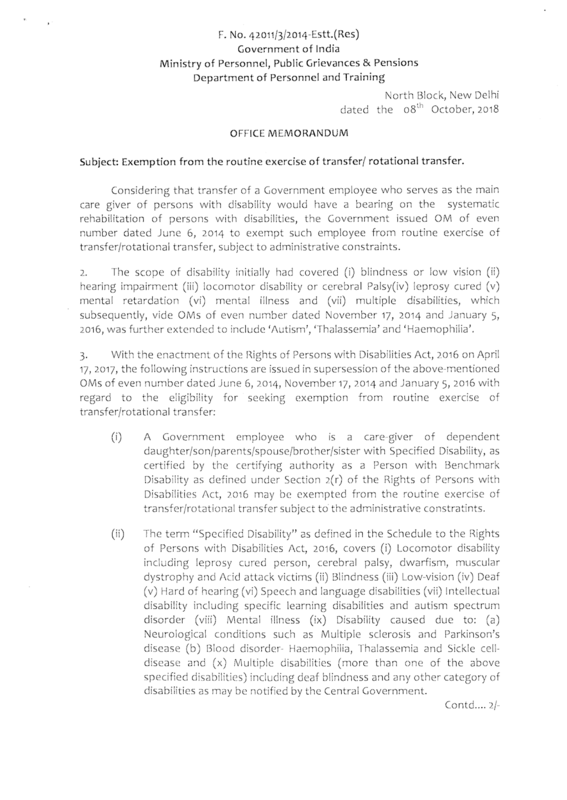 (i) A Government employee who is a caregiver of dependent daughter/son/parents/spouse/brother/sister with Specified Disability, as certified by the certifying authority as a Person with Benchmark Disability as defined under Section 2(r) of the Rights of Persons with Disabilities Act, 2016 may be exempted from the routine exercise of transfer/rotational transfer subject to' the administrative constraints. 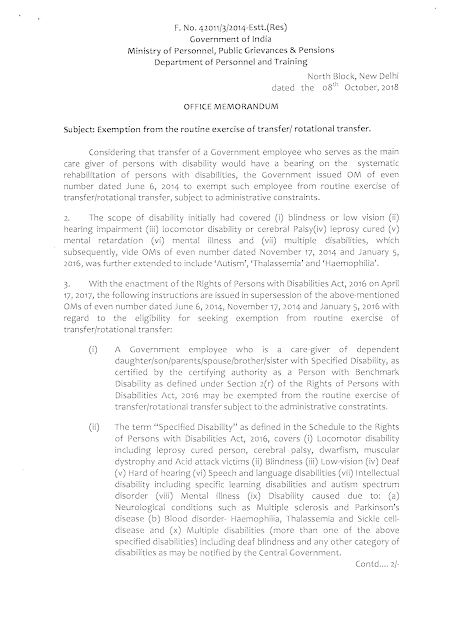 (ii) The term “Specified Disability” as defined in the Schedule to the Rights of Persons with Disabilities Act, 2016, covers (i) Locomotor disability including leprosy cured person, cerebral palsy, dwarfism, muscular dystrophy and Acid attack victims (ii) Blindness (iii) Low-vision (iv) Deaf (v) Hard of hearing (vi) Speech and language disabilities (vii) intellectual disability including specific learning disabilities and autism spectrum disorder (viii) Mental illness (ix) Disability caused due to: (a) Neurological conditions such as Multiple sclerosis and Parkinson’s disease (b) Blood disorder Haemophilia, Thalassemia and Sickle cell-disease and (x) Multiple disabilities (more than one of the above specified disabilities) including deaf blindness and any other category of disabilities as may be notified by the Central Government. (iii) The term ‘Specified Disability’ as defined herein is applicable as grounds only for the purpose of seeking exemption from routine transfer/rotational transfer by a Government employee, who is a care-giver of dependent daughter/son/parents/spouse/brother/sister as stated in Para 3(i) above.